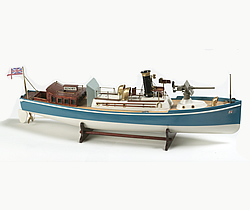 Billings Boats BIL604 HMS Renown Steam Pinnace 1/35 scale wood ship kit! This ship is a 50-foot steam pinnace from around the middle of the 19th Century. These boats had a small forecastle, a room for the crew, a boiler room and a cabin. Above the crews’ quarters was a conical steel base with a permanent universal ring, on which a 3-lb quick-firing cannon or maxim machine gun could be mounted.